Video uploaded by organist Jean-Philippe Le Trévou shows the aftermath of the blaze. 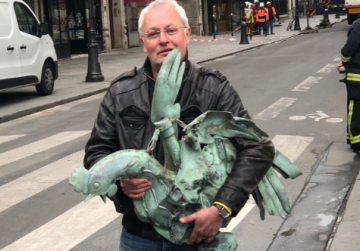 Meanwhile, a wrought copper statue of a rooster that sat atop the Notre-Dame spire has been found "battered" in the debris of the Paris cathedral. The sculpture of the bird -- which is an unofficial symbol of France -- was recovered Tuesday by a restorer picking through the rubble left when the spire, on which it had sat, toppled at the height of the inferno that ravaged Notre-Dame on Monday, a ministry spokesman told AFP. "The gratitude of the whole Church goes to all those who did everything they could, even risking their lives, to save the Basilica," he said during the weekly general audience in Saint Peter's Square. Francis said he had been "very saddened" by the vast blaze on Monday which gutted the great Paris landmark, destroying the roof, causing the steeple to collapse and leaving France reeling in shock. The bells of all cathedrals in France will sound at 6.50 pm on Wednesday, 48 hours after the fire started.